Our product range includes a wide range of pankha border. As an ace name of Pankha Border, we have marked our name very strongly in the market. The entire range is beautifully crafted with precise care under the stiff guidance of our experienced professionals using the finest grade embellishments and other requisite threads. Besides this, we ensure that highest quality guidelines are maintained at every level of the organization. This one comes with a very strong thread and is enhanced with an attractive and unique design as well. 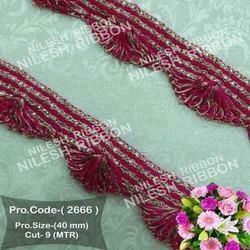 We create a different and most expensive range Pankha Border.